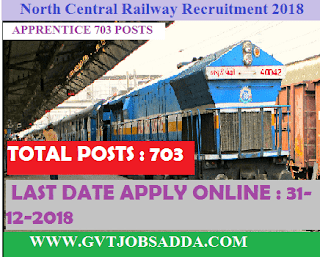 Delivered by FeedBurnerNorth Central Railway Recruitment 2018 : North Central Railway Has Published Apprentice notification for 703 posts, Those candidates who are eligible & interested they can read official notification North Central Railway Recruitment 2018 and apply online before last date of apply online.Brief information has given below interested candidates may check & apply North Central Railway Recruitment 2018. Vacancy Details Are Given Below. North Central Railway Recruitment 2018 Education Qualification & more details. The candidate must have passed 10th class examination or its equivalent (under 10+2 system) with 50% marks and ITI pass certificate in related trade from a recognized Industrial Training Institute affiliated to NCVT. Candidate must have completed 15 years and should not have completed 24 years of age as on 30.11.2018. The upper age limit may be relaxed by five years in case of SC/ST candidates and three years in case of OBC candidates. For physically handicapped persons, upper age limit is relaxed by 10 years. The selection of Act Apprentice for training will be done on the basis of merit list of the candidates who have applied and are eligible in reference to the notification. There will be no written exam or interview/oral exam in this selection. Merit list will be prepared on the basis of percentage of total marks obtained in 10th or its equivalent Exam by a candidate from recognized educational Board / Institute plus ITI examination marks. For More Details About Education Qualification Age limit and more details about North Central Railway Recruitment 2018 candidates should visit official website & read notification regarding apprentice 703 posts.